The Georgia Bulldogs have moved their 2016 football game against Georgia Southern to the 2015 season, SicEmDawgs.com has learned through an Open Records Request. Georgia was previously slated to host Georgia Southern at Sanford Stadium on Nov. 19, 2016. But according to a Memorandum of Understanding signed by both schools last month, the game will now be played on Nov. 21, 2015. The Georgia Southern Eagles will receive an $850,000 guarantee for the game, and the cancellation fee is the same amount. Under the previous game contract signed back in 2010, GSU was to receive $525,000. 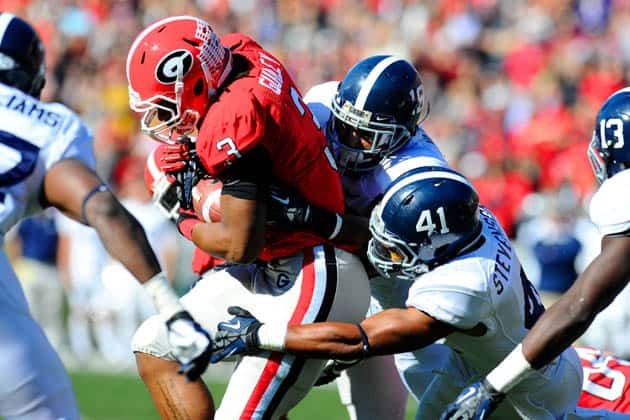 UGA is 5-0 all-time against Georgia Southern. The Eagles are moving up to the Football Bowl Subdivision (FBS) and will play in the Sun Belt Conference beginning with the 2014 season. With the Georgia Southern game moved, the Georgia Bulldogs have now tentatively completed their 2015 non-conference football schedule. The Dawgs open the season vs. Southern on Sept. 5, host ULM on Nov. 7 and GSU on Nov. 21, and then finish the season at Georgia Tech on Nov. 28. Georgia now only has one game scheduled for the 2016 season, a Nov. 26 contest against Georgia Tech in Athens. UGA director of athletics Greg McGarity has paused the scheduling of future football games until the SEC determines whether or not they are moving to a nine-game schedule. Further discussion on the issue, and possibly a resolution, is expected to take place at the SEC’s meetings in Destin this Spring.